Have big plans this February 14th? Get dressed up (or down) in an outfit that will win over both hearts and compliments. Whether you’re planning a romantic dinner, hosting a party with the girls, or having a cozy night in, we’ve got a standout Valentine’s Day-ready look for that. From flirty frills to tailored silhouettes, inject some much needed colour and print into your V-day style. Here are our top picks on what to wear on the day dedicated to love. Give those brighter pinks a raincheck this Valentine’s Day and turn to softer shades of blush and dusty rose. This v-neck sheath dress perfectly nips in at the waist for a flattering silhouette, finished with an elegantly flared trumpet skirt. 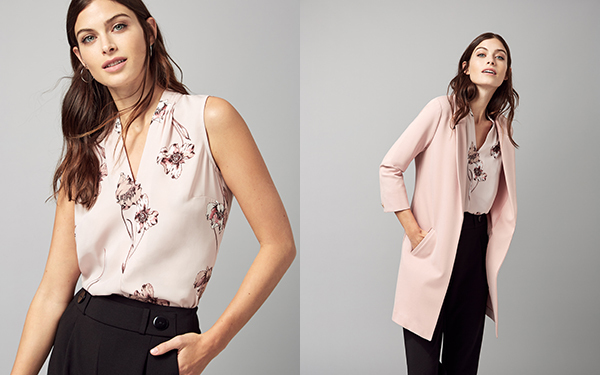 For a sleeker style, go for this pretty-in-pink option, featuring a chic knot detail and a beautiful floral print. Complete the look with some pastel pink accessories. Go for a bold twist on a classic Valentine’s Day hue with this red sheath dress. The angled neckline, knee-length hemline, and pleating details offer a sophisticated and modern feel. From dinner with your sweetheart to a night out with your best gals, turn up the heat with some strappy stilettos and a top handle clutch. Because being best dressed doesn’t always mean a dress. With its deep-v neckline, intricate lace back, and tailored fit, this sleek jumpsuit was made for making moves. Look and feel fierce in this black one-piece number, no matter what you have going on this V-day. Spice things up with some bold earrings and snakeskin pumps. Make a swoon-worthy statement with sweet-as-can-be shades of pastel. Give your workwear ensemble a V-day refresh with this floral-print sleeveless blouse paired with some high-waisted trousers. For an unexpected dinner date, throw on this millennial pink boyfriend blazer. If your plans are simpler (or involve Netflix), you can still infuse a little Valentine’s into your day with a fluttery-sleeved top. This dusty rose option is timeless and sweet, and looks great as a backdrop to a pair of tortoiseshell earrings. Or, go for this off-white option detailed with dainty pearl-like stones. Finish off the look with some funky metallic earrings and your favourite pair of denim. Click here for even more Valentine’s Day style inspiration.